Nutella dipped frozen bananas are one of the best treats especially on a hot day! I like to think they are a frozen ice cream treat but better! Watch the video to get a better idea on how these come together as a quick and easy treat! 1/4 cup Nutella (I had tried to microwave for around 10 seconds to get smooth I don't recommend that as it doesn't melt well and clumps up, I found it worked better at room temperature or if you do microwave only 12 seconds to a small 1/4 cup.) A little messier to spread but still wonderful!) Also make sure the Nutella is fresh not too old or dried out, it gets too thick. My last tip is to mix the Nutella with 1/4 cup melted good grade chocolate for a smoother finish! NOTE if you can't find Nutella ( use a good grade melted chocolate with heavy cream in equal amounts 1 cup of cream 1 cup of chocolate, which makes a ganache see recipe for ganache) or click here for homemade Nutella Recipe from Curt's Delectable Blog.) proceed with directions below. Place the banana on the parchment paper lined cookie sheet, with a spreader, spread Nutella on the bottom of a whole (skin off) banana place on parchment lined sheet pan or dip chunks into Nutella and place on parchment paper. Then smooth the top of the banana with back part of the teaspoon to carefully cover any parts of the banana still showing sealing all the way around with Nutella. Note: ( If using nuts lined the bottom of the parchment with nuts first, nutella, place banana on top of this mixture and proceed the same for the top using nutella first then sprinkling with nuts.) A little messy but your going to like the results and taste later! Place a toothpick every two to three inches apart in the banana and freeze for at least an hour. I didn't smooth them out here with the back of the spoon, I just glopped it on and frozen them! I couldn't wait to eat these, they are one of my favorite desserts, even as a child! Slice every two inches after they are frozen and eat use a very sharp knife! Refreeze cut leftovers in a zip lock bag. These were very difficult to photograph since it was a very hot sun, don't let the picture discourage you they still tasted great! Chocolate and banana...frozen to deliciousness! They remind me of the chocolate covered bananas you can buy in Disney! Awesome! can you believe I'm out of Nutella? Have to go shopping so I can try it! Really, can this combination be bad? I think this should count as breakfast, lunch, dinner...and snack. Love a quick and delicious recipe to get a sugar fix...beautiful (and I can relate to the photography dilemma...a constant challenge, isn't it????). Perfect! My mouth is watering. Now there's something I definitely need to try. Those look and sound delicious. Sounds so delicious. I love frozen dipped bananas. One time I had dipped mine in chocolate with crumbled Butterfingers. Yummy! I bet this tasted so good! I LOVE frozen bananas! I like how you made bite sized pieces. This is perfect for a crowd! The best idea yet as to how to incorporate more potassium into your diet! Utterly wonderful! Two of my favorite flavors/foods! Love this idea, will make a snack like this for 5 Star Foodie Jr. she loves nutella! It must be Nutella Day because yours is the second Nutella recipe I've read in the past 3 minutes. And now I have to go because I have one banana left and just enough time for it to freeze before I go to bed. YUM! A combo made in heaven Claudia. Mighty creative!!! Perfect snack for these hot Florida afternoons. Now that is what I call an awesome frozen treat. You may have cut these into little pieces, but I am sure that more than one was requested. Great post! I can tell you're a Nutella lover. I love chocolate covered bananas so I'm sure these are delish! I still need to make your nutella rice krispy treats. I bet they tasted fantastic! How can you not love bananas and nutella together?! I love the first picture..it's like popping out of the screen calling me name:)) Fantastic idea! 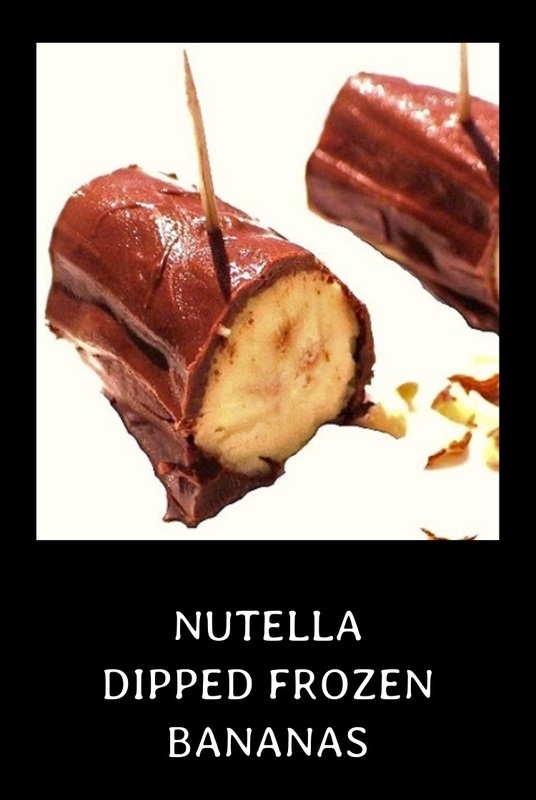 I love chocolate covered bananas so nutella is a great alternative! I love frozen bananas. I eat them every day. If I added Nutella to them I would be unstoppable!! What a great idea. This definitely looks like an eat quickly sort of treat. Gosh Claudia, is there anything you don't know how to work out with? Hats off! Oh heavens, these are delightful! One of my all time favorite treats are frozen banana...and now this! I love desserts made with fresh bananas, especially when they are frozen. Yum!